On February 8th, from 10 a.m. until Noon, law abiding gun owners around the nation will be descending on their state capitols to protest in favor or the 2nd Amendment, and against the Tyrannical laws now being crafted by those traitors in Congress who would see us defenseless. Most of the credit for the organization of this event in Lansing goes to David Pyzik and Paula Anders III; I'm just going to provide the sound system and use it to run my mouth. Apparently, that is MY God-given talent. The Truth Is Viral will be broadcasting live from the Lansing Michigan event on Livestream.com/ttivlive and Bambuser.com/ttivlive, and yours truly will be a featured speaker. 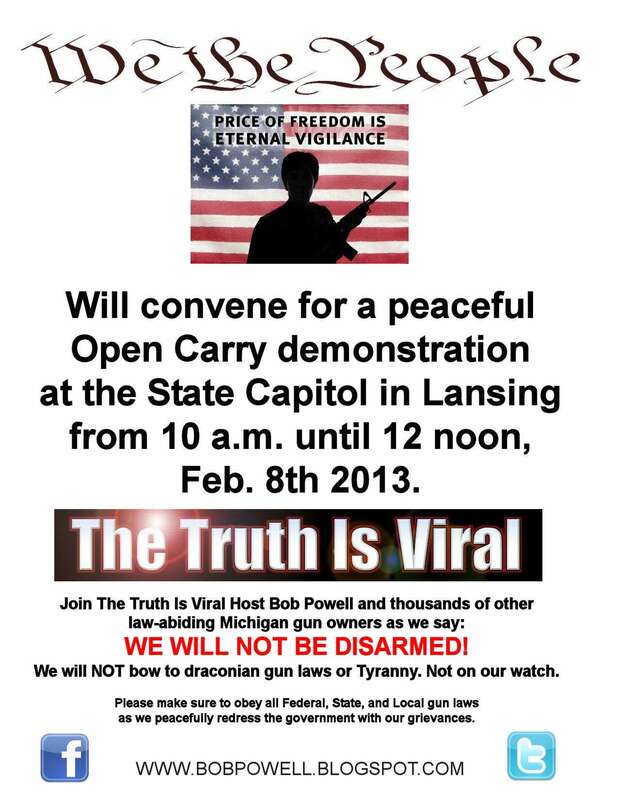 There will be hundreds, if not thousands, of Michigan citizens exercising their First Amendment right to free speech in order to protect their Second Amendment right to keep and bear arms; before the situation reverses and we must used the second Amendment to retain the rest of the Natural Rights of men enshrined in the Constitution. We have to speak out, before we have to fight back! Here is the event page on Facebook. And a full-size flyer for any Michigan residents who want to print it out and spread it around. It makes NO DIFFERENCE where you live. This event is taking place nationwide, on the Capitol steps of every state in the Union. Tension are rapidly approaching a boiling point in this country, with ordinary citizens, entire Sheriff's departments, and even the Michigan legislature telling the Emperor-in-Chief to take his Tyranny elsewhere. We do not want a dictator, and By God we will not have one!